I think I wish it was the 60th Anniversary restoration Blu-ray. Yeah, as long as you don't have to buy food, pay rent/mortgage! The film will have optional subtitles in GERMAN as well as in ENGLISH. The main documentary THE HUNT FOR M / THE HUNT FOR THE FILM ELEMENTS in Disc 2 is narrated in ENGLISH and will have optional German subtitles. Please tell me that the ugly ratings logo is a sticker or something removable and I might buy it. The only German Blu-ray in my collection, Bathory, has a reversible cover - one with the ratings logo, the other without (but otherwise identical). But I have no idea if this is a general rule. You know what, the "reversible cover" counts as an extra/bonus feature in Germany…ridiculous! I think that here is no thread for this label and there is an very important announcement to start with. - Torsten Kaiser moderated - executive producer of the digital restoration of "M"
- and (think at least in the featurette "U"M "THE WORLD IN 80 YEARS" with partial extensions, further we do) the French Rental Act, 1932 "" M "- Le Maudit" newly scanned negative from a preservation duplicate and Sound Negative (Here you will find in comparing the 1932 British rental version of the 1960 re-release and the 1995 reconstruction of the 2001 Preservation and Restoration of the 2011 and the 2001 "raw" Preservation Material vs. on display in 2011 Restoration Final Master). The Blu-ray edition is Region A, B, C - the DVD Region 0. Film and extras have optional German and English subtitles. The collector's booklet (60 pages) will be included. My copy is on the way, too . Last edited by djvaso on Sun May 22, 2011 2:52 pm, edited 1 time in total. Cannot see them. Maybe the images are only available for those who registered for that forum? andyli wrote: Cannot see them. Maybe the images are only available for those who registered for that forum? Yes, I fix it now. 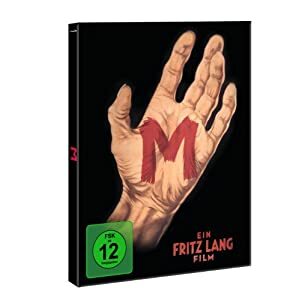 I have not been able so far to find any English reviews of the new Universum Film 80th anniversary M blu-ray. The packaging looks nice in the pictures above, but can anyone tell us whether the new restoration presents a significant improvement over the CC and MoC Blu-Ray editions? I understand that the film has English subtitles and apparently the extras, too. But can someone verify whether ALL extras have optional English subtitles? The commentary doesn't have English subtitles unfortunately. The PQ and especially the sound is a big improvement from the Criterion BD. Beaver on The Cabinet of Dr Caligari This should wet the whistle for those waiting for the MoC or Kino versions.